Hi. Just wanted to give you some feedback and say thank you. I made this chili today and it turned out great. At first I felt like maybe I should tweak it a bit, but I also felt I should make it as prescribed first to see the results. I did want to ask if there is a specific reason for you not using tomatoes in this recipe. I really like tomatoes and will probably add them next time I make it. The heat/spice was just about right by the way. For my beer I used a blue moon belgian white. 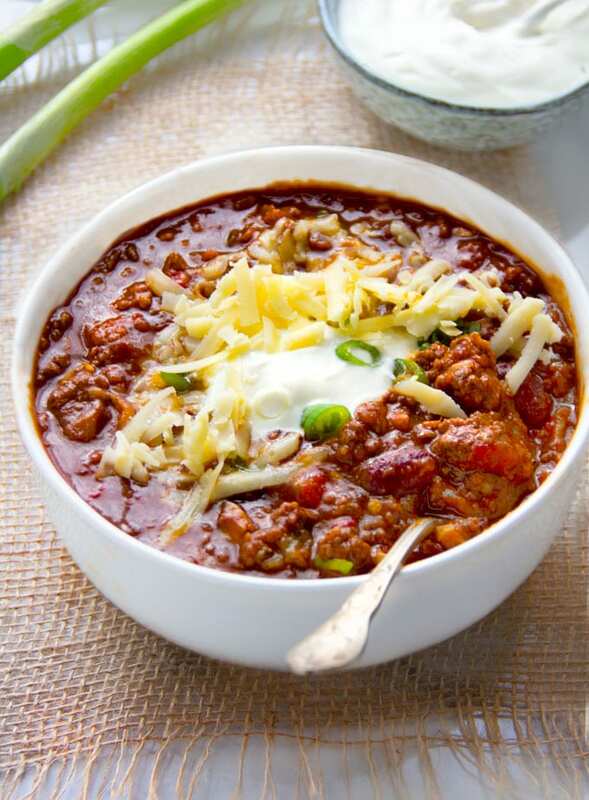 I also wanted to add that this chili would also be perfect for chili dogs or chili fries! I’ll look for your reply and thanks again. Hi Ed – thanks for the comment and the star rating. I’m glad you enjoyed the recipe as is and I do think it makes sense to try a recipe as prescribed just to see how it tastes before tweaking. There is no specific reason I don’t use tomatoes – certainly there are a lot of tomatoes within the tomato sauce and tomato paste so I think their flavor is well represented, but in terms of whole tomatoes I never tried that. Please let me know how it works for you. All the best! Thank you Eddie…I finally won 1st Place yesterday at our vlubs 8th annual Chili Cookoff!! I say finally, because I’ve pkaced 2nd & 3rd in other years, but never 1st. I followed the recipe in its entirety and added 1 can of traditional Rotel tomatoes and a few drops of liquid capsaicin to just up the heat a smidge. I loved the meats used and that bacon & sausage made all the difference. Hi Kasey – I don’t have much of an answer for you other than the recipe I adapted used chicken broth and no worcestershire sauce. There is so much flavor in this recipe already I am not sure it needs other ingredients but feel free to try these adjustments and if you do, let me know how it turns out. Used a slightly modified version yesterday in a chili cook off and took first. Had to cook 5 gallons so it was almost quadrupled! I believe the roasted peppers made a big difference. I left out the beans this time (I personally love the beans), in south louisiana, chilli is not usually with beans. I used ground chuck and chuck stew meat, made a really lean chilli. With 16 lbs of meat (chuck, Italian sausage and bacon) there was only.a cup of grease to remove. A competitor removed almost a half gallon!! Again, great Recipie! I will do it again! Congratulations Clayton. 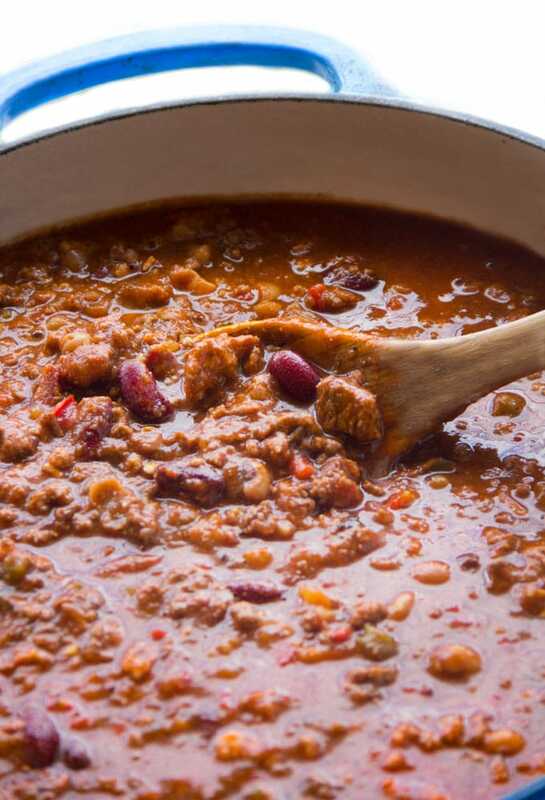 Wow – 5 gallons is a lot of chili. You certainly earned it! I get the thing about the beans. That’s awesome Ed. It’s a wonderful thing to cook with your grandson I imagine. He must have been very proud of the first place finish! Thank you for the recipe. Your chili just sweep the TTF King’s Bay command chili cookout. The only change I made was, the cookoff was first thing in the morning and a guy at work recommended to let the chili sit in the refrigerator over night. Turned out great. If you are ever in southeast ga, I owe you a beer. Thanks again. 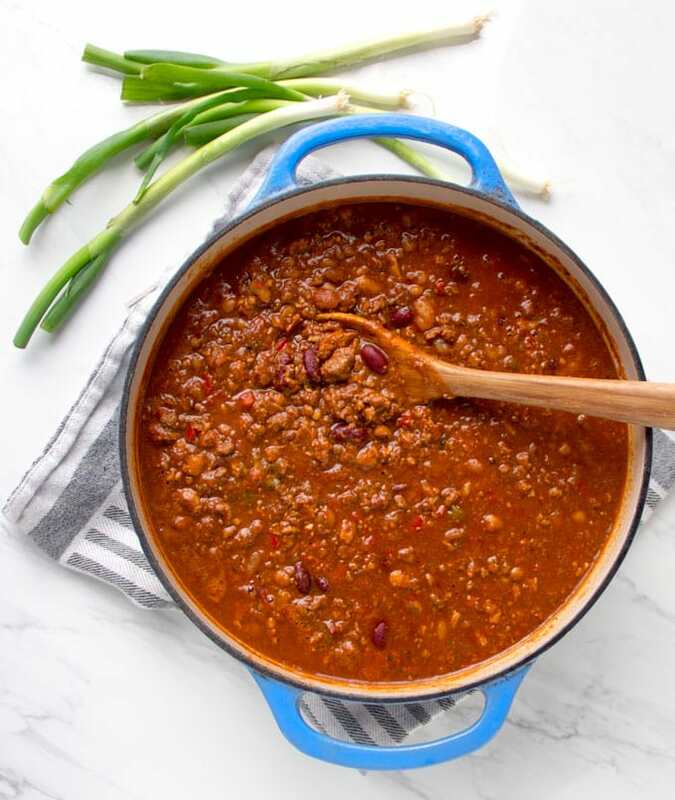 Hey Josh – I totally agree about the power of leaving the chili to sit overnight. I do that myself when I enter a contest mostly because there is no other way I can get it done before bringing it in to work, but I also came to find it improves the flavor. Congratulations! I don’t get down south much but I sure appreciate the offer and possibly one day will be swinging through. 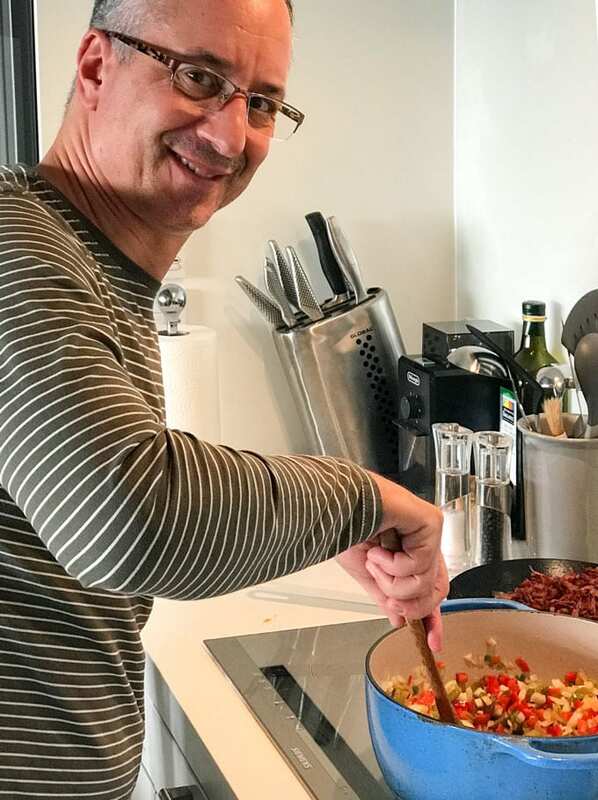 Hi Darren – I live in the UK these days too and have the same issue with getting the right peppers, but you can get close enough I have learned. Thanks for this awesome recipe Eddie my wife and I just tried it today and the flavor was spot on! My wife keeps on taking sample tastes while the chili is simmering 🙂 We didn’t had the anaheim peppers and IPA but it’s ok we’ll try to add those next time. This one’s for keeps. Hi Andrew – so glad you and your wife enjoyed this chili. Yes, tough to stay away from those little sample tastes, but helpful too if there are any adjustments to be made. Enjoy! Best chili I’ve ever made—and really the best I’ve ever had! It was a lot of work, but so worth it. The texture is simply amazing. Thank you so much for sharing it! Thanks for making my day Nicolle. Glad you enjoy this recipe – yes, I agree the texture is a big part of what makes this special. I have to say I just won the chilli cookoff at our church for the Knight’s of Columbus. The chili was voted the best hands down with no one coming in close. The comments were glorious and I was embarrassed by all the compliments and attention!!! 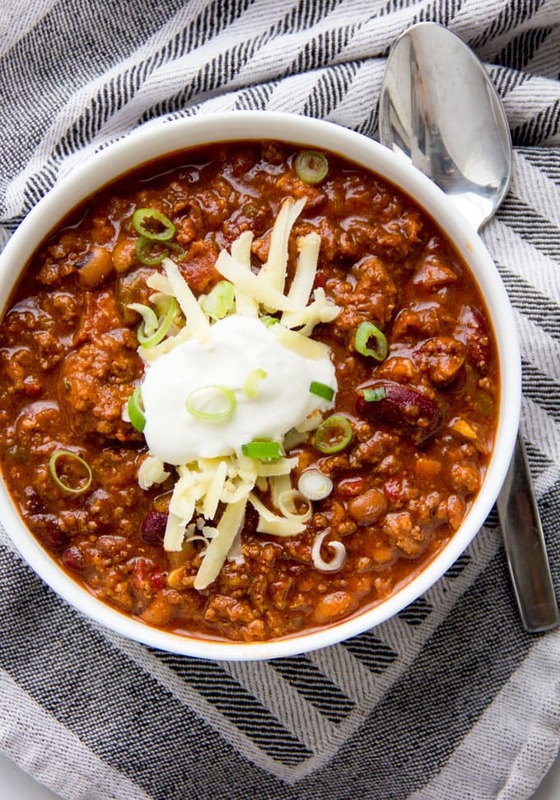 This is the best chili I’ve ever tasted and so worth the effort. It was fun to gather the different ingredients and then watch the expressions on the faces of the judges!! Congratulations on your win Suzy! Sounds like you did a fantastic job making this recipe. I will be making this recipefkr this Saturday’s chili Cook off. Can I simmer the chili in a crock pot instead of the stovetop? If so, how long should it simmer in the Crock-Pot? 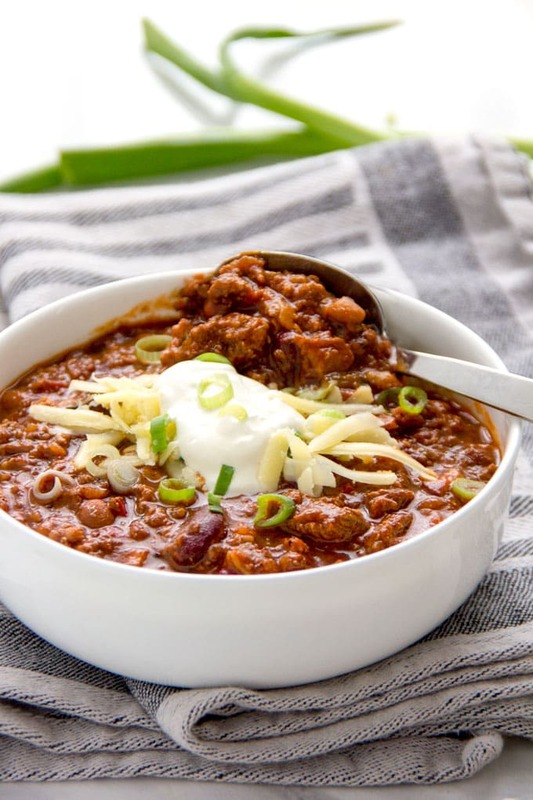 Found this recipe just in time for National Chili Day tomorrow! I added diced carrots and a touch of vinegar. Just had a bowl, it’s very balanced and delicious. I will add more slice next time around. Thanks for the share! Can’t wait to try the recipe……..thx! 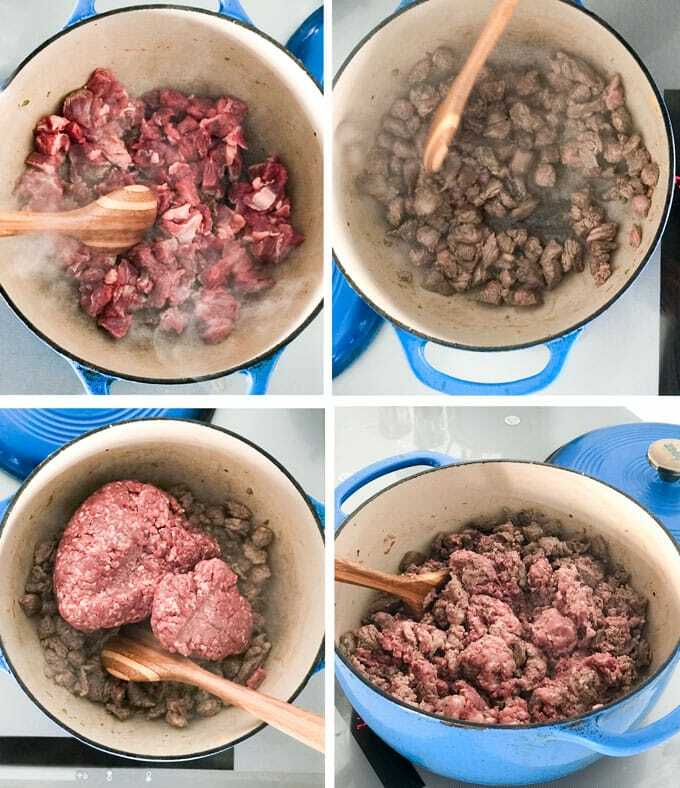 Hi Sheila – I don’t drain the meat after browning, the juices become part of the chili. As discussed in my recipe, you can skim the surface of the pot from time to time to reduce the fat content a bit if that’s behind your question. In any case, good luck to you! You’re right. It’s a winner! I won in a 12 pot cook off! 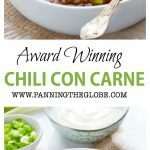 I just won the chili cook off at my job by following this recipe exactly! Love it so much!!! Congratulations Laura! So glad to hear you were victorious – enjoy the glory. Excellent recipe. Googled ‘Award wining chili recipe’ before entering my first chili contest at work. Made a few small changes such as adding Worcestershire sauce and used ground turkey instead of Italian Sausage. Finished 3rd so quite happy. Found out the 2nd place finisher was also a chili rookie who googled the same phrase as me. He ended up with the exact same recipe. Later found out voting for the winner was skewed as they received votes even after their chili ran out. So a 2nd and 3rd place both from rookies with this recipe is a pretty good showing.. Will definitely make again. Thank you. Good to know that this recipe was well represented at your cook off. Congrats on your finish especially as a rookie! I appreciate your coming back to leave a comment. I just won my church chili cook off, first place!! It was a time consuming recipe but well worth the pay off! I only roasted poblano peppers and did not used cubed meat. Only ground meat, sausage and bacon! Other than that I did the exact recipe!! It is so complex and flavorful! Thank you for sharing! Congratulations Melanie – so glad you took first place at the church cook-off! Well done. This chili was amazing! 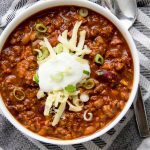 My husband used to call my chili bland and “tasted like it was from a can.” This recipe, however, he loved!!!! I made some adjustments, I added a sprinkle of cinnamon, worstshire sauce and a bay leaf. I omitted the beans since we’re not huge bean fans and it turned out great. We’re low carb so we used Michalob ultra for our beer and it was great!!!! Thank you! Hi Jonna – yes, this recipe is unlikely to be considered bland with so much going on. Glad it worked out for you and your husband. Just wanted to say thanks Eddie! I entered my first chili cookoff today, did a little tweaking for the region I was in, AND TOOK FIRST PLACE! This is an awesome recipe and fun to make. Thanks for the info bud!!! Congrats, Joe – first time winner! I was so nervous to try this recipe but seeing all the comments of all the winners, I just had to give it a try. Anyways, I just did some minor tweaks but followed everything to the T. Rinsed the beans, did not do the Anaheim peppers and added an extra poblano pepper, added an extra half a cup of stock, added about 8 dashes of Worcestershire sauce, and added hotter than hot texas pete. I WON FIRST PLACE!! First time entering a chili contest and judges said it was an automatic first place. Thank you so much for the recipe! Congrats on your first time win, Jamie! Automatic first place – love that. 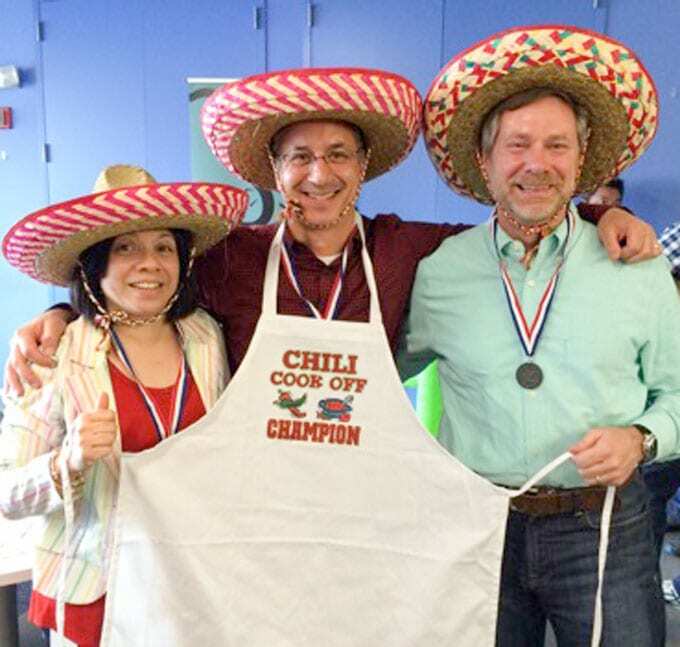 Took first place in my workplace chili cookoff today! Thanks for sharing! I did back off the cayenne pepper to appeal to a wider audience, but the next time I make it think I will try it as is. Congratulations Suzanne! Good move adjusting the heat for your audience. I made Guy’s Dragon Breath chili recently and I have to say, it is hands down the best chili I’ve ever eaten. I consider myself a very good cook and I can usually tell how good something is going to be by the ingredient list. 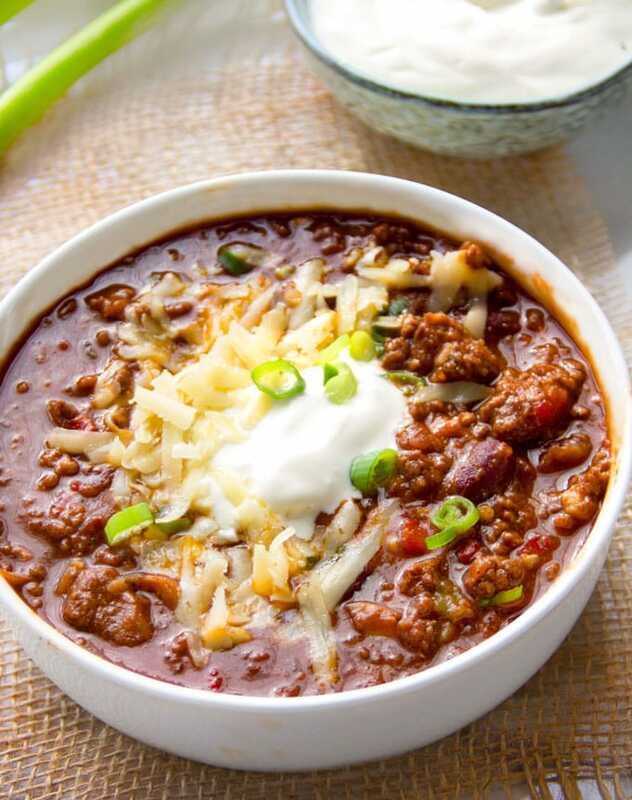 Most chili recipes on the internet are…. blah, that can’t win anything… This one hit the “this is gonna be good” mark. I made several minor tweaks as you did… It was amazing and I can’t wait to win the office chili cook-off with it next year. Cheers to Guy and cheers to you Eddie! Eddie, you rock! I just won a chili cook-off at my work with this recipe! I can’t say enough about how good this recipe is as a guideline. I had to play with the measurements a bit (because we have different regulations on can sizes in Canada), but it had great flavours. I added a teaspoon of cinnamon, some bay leaves, a dash of Worcestershire sauce and used half of the Cayenne powder and it turned out amazing — just the right amount of heat. You’ve got yourself a winner here. Hey Matt – congratulations on your winning entry! Glad to know this recipe works even in Canada with a couple of tweaks. Enjoy your blue ribbon.